A little while ago, we posted a Mobile Friendly Forefront TMG Forms Based Authentication template to make logging into internal sites protected by Forefront TMG easier on phones and tablets. Soon after we added a template specifically for Exchange OWA and thanks to some community contribution (thanks ablanken! ), fixed some bugs to do with the public/private network setting. With the release of Exchange 2013, we thought we’d create a new mobile friendly authentication template in the new Exchange 2013 Outlook Web App style. Download the new template package here, or from the GitHub repo. The package contains three templates; ISA, Exchange and Exchange 2013. Copy all files in the Exchange2013\HTML folder in the above template package zip into the HTML sub-folder of your new ‘Exchange2013’ folder (replace the existing files). Feel free to replace Logo.png with your own custom logo. In your TMG Management console, edit your desired Web Publishing rule and go to the Listener page. Click Properties. If you used the Exchange Publishing Wizard in Forefront TMG, you also need to go to the Application Settings tab and enter ‘Exchange2013’ in the ‘Type the custom HTML for set directory’ edit box. Thanks very much to our good friends Richard Hicks and Will Smothers for persevering through countless Firewall Service restarts helping us test the template and bolt it into good working shape! Enjoy and we look forward to hearing what you think in the comments! Can this be ported to UAG? i follow above, but for logout page the logo image are very big and cover the text, and for changing password page its not change. does this can be modified to be same in exchange 2013. Thanks for trying it out. What browser are you using when viewing the logout page? Are you able to send a screenshot to [email protected]? At the moment, I’ve only customized the login and logout pages, but I’ll look into customizing the ‘change password’ page too. Stay tuned. I’ve tested putting this form in place on our TMG server and everything’s working except for the message at the bottom of the form says “Secured by Microsoft Forefront Threat Management Gatewayy” with an extra “y” in “Gateway”. Haha. I must have submitted right after you did. Haha. Synchronized bug fixing for the win! Thanks again for reporting it Cory. Much appreciated. I too am having the issue experienced by Abdarrhman whereby the logoff message is hidden behind the logo. Currently running in IE9, works fine in Firefox. Thanks for letting me know. Is IE running in compatibility mode by any chance? Go to the page and hit F12 to bring up the dev tools. Have a look at the Document Mode Menu. Change it to IE9 if it is set to anything lower. Thanks Scott, that worked. For some reason IE thinks the default document mode is Quirks Mode. Not sure if is something in my configuration, but when I hit view source the DOCTYPE is commented out. Glad to hear that was the issue. I made a change to the files recently to force IE not to render the pages in compatibility mode. Grab the latest template .htm files from the project and hopefully that fixes the issue. The exclamation mark is part of the declaration. Is this what you’re seeing when you say it’s ‘commented out’? It could just be a rendering issue with IE’s ‘View Source’ function. Any chance you are able to include the chpwd files also in the Exchange 2013 format? Thanks for the quick reply and yes, you are right. I was only copying the HTML folder(from the zip) and not the Test folder. Once I copied everything, it works! I see that only the logon and logoff pages have the new look, and post logon the UI is Exchange 2010. Is that correct or am I missing something? Glad to hear it’s all working now. That’s right. This project only relates to the Authentication Forms you see when Exchange is published through Forefront TMG. Once you’re past those forms, you’ll be directed to whatever version of Exchange you’re using. Only the login and logout pages have been customized. You’ll still see the old forms for any other pages such as the ‘Change password’ page. I’ll hopefully get to those pages soon, unless someone else wants to do them and contribute to the github project? I am using it already and everything seems to work fine except for the “Change Password after loggin on” choice. If I check that box it does redirect me to the change password webpage, but is not able to do the password change. Could you help me setting this up? Thanks for getting in touch. I haven’t customized the change password page yet so I don’t see why it wouldn’t work. Does it work when using the normal/old template? Well, I just did the test with the normal/old template and surprisingly… did not work. So we have discarded a template issue. This is the first time I configure the TMG, maybe you have any suggestion? Hopefully the answer is in there somewhere! Im getting Error Code: 500 Internal Server Error. Element not found. when I click logoff. Any idea why ? Not sure Adam. I haven’t heard about this before. Does it happen when you don’t use the template? When I dont use template it works fine. It sounds like there is a file missing in the Template’s folder. Did you copy the everything from the default template folder (C:Program FilesMicrosoft Forefront Threat Management GatewayTemplatesCookieAuthTemplatesExchange) then copy in the few files from my Template? Can you verify that the file ‘logon_redir.htm’ is present in the template folder? We are using Exchange 2013 SP1. We are also facing the same issue, On the OWA page, when I click on Sign out, OWA doesn’t sign out.. It gives me “Sign Out” window with statement: “To finish signing out, please close all browser windows”. 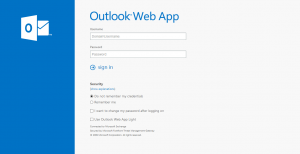 In TMG OWA rule i have included this to publish server logoff page: /owa/logoff.owa. But still its not working. 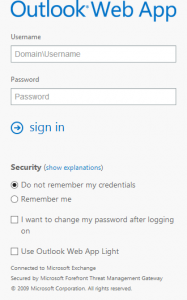 Forms authentication is disabled, basic and windows are enabled. Please guide to solve this issue. 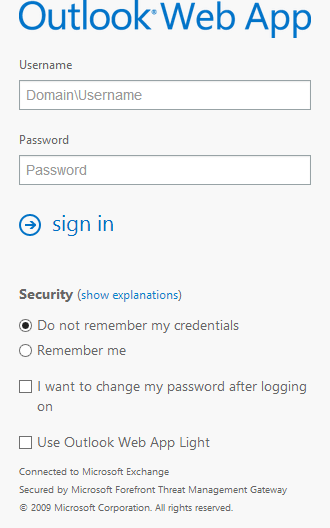 I believe what you’re seeing is the default behaviour when using non-forms-based authentication. Did you have to do anything beyond the steps above? I enabled PassCode auth with RSA tokens and it doesn’t render the updated look at all. It seems when you enable PassCode auth, it points the default page to another file that hasn’t been update with the new layout. I’ll hopefully get to the others soon! I’ve been wanting to spend some time on this project to rework the change password page and a few other items some people have mentioned. If you want to try it yourself, it should be relatively easy to find the page that TMG is serving for PassCode auth, compare it to the page it usually serves for Windows Auth, and find the differences. Then copy my new template for windows auth and paste in or remove the differences. For example, there may be extra input fields on the PassCode form. I read through your post and have tried to implement the solution but have had issues. I have copied everything from Exchange/HTML to Exchange2013/HTML and copied your files into this folder. I have noticed that images do not load at all. I can email you a screenshot if necessary. I would love to get this working correctly. Please advise if i have done something wrong. Open the developer tools in your browser (F12 in IE) and browse to the form. Are there any errors in the Console section? If so, what are they? I just discovered another potential issue that could cause some of the problems mentioned here. Ensure that the files you copy out of my zip file do not have the property “Encrypt contents to secure data”. The files will appear ‘green’ in Windows explorer if this option is on. If so, right-click the files and go to Properties. On the General tab, click Advanced and uncheck the “Encrypt contents to secure data” option. Do you know if this would work with ISA 2006? Great question! I’m not sure if it would work or not. Do you have an ISA 2006 still up and running to test it with? I’d be interested to hear the result. Thanks for the quick reply…yes, we still have 2006 and I might give it a try…if I do I will reply back. Just didn’t know if you had anyone try it before. If they have, I haven’t heard anything. 🙂 Good luck! I do also have some pending commits to make. I’ve been through and modified all the other forms such as the change password form and the forms for the other authentication types. They’re just being tested at the moment. OK – everything has now been committed. This is great! Thank you to all who worked on putting this together. I did find another typo. “Exchange2013/HTML/logout_smimecap.htm” String “@@L_SecuredByISA” has another extra y at the end. Hey Philip, Thanks for picking up that typo. I’ve fixed it and updated the file(s) on the GitHub repo. This is cool, thank you. The only problem is I did everything in your manual but the old form (the yellow one) is still showing. As soon as you’ve RSA SecurID enabled for Authentication in your Web Listener it is showing the old form with the old yellowish pictures. As soons as you change the authentication validation mehod of the web listerner to Windows or LDAP it works. As soon as you change the authentication validation method of the web listener to Windows or LDAP it works. Like in all the other folders you can only find the usr_pwd and not the usr_pwd_pcode or usr_pcode. “Due to popular demand, I have now customized all forms in the Exchange2013 folder including the Change Password form, and the forms used for Radius and SecureID. However in the other two folders (Exchange and ISA), only the usr_pwd.htm file has been customized. This file is served only when using Windows (Active Directory) authentication (set on the Authentication page in step 5 above). The pcode.htm file is one of these files. I don’t believe there is any such thing as usr_pwd_pcode or usr_pcode. Do you see the files? Hi, thank you so much for these. I seem to have an issue with removing the ‘DomainUsername’, as we would only like to have ‘Username’. I have the default domain specified, but the form continues to show ‘DomainUsername.’ I am able to login with just the domain name. Any ideas? Change “Domainuser name” to just “Username” or whatever you’d like to see. Then save the file and restart your firewall service. It is a Simple tool to edit the Forms Based Authentication page and make it different than what’s default. To change all the templates. Tell me where the language of choice? Thank you.